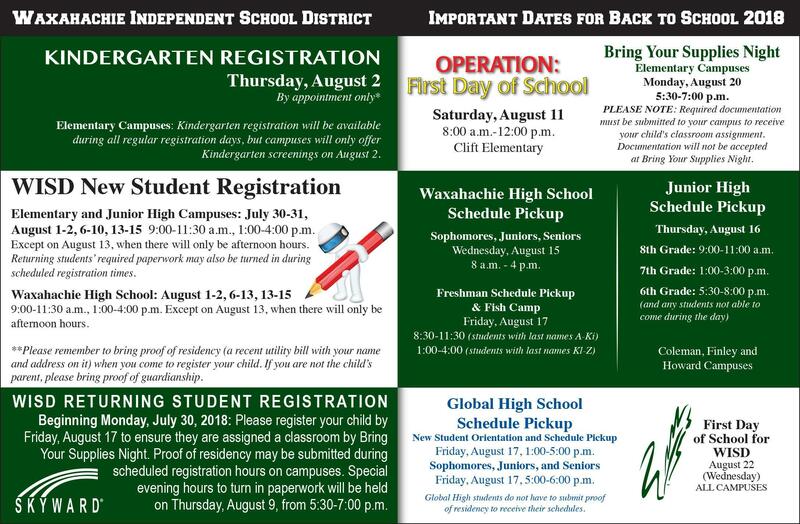 We are looking forward to an amazing journey in Waxahachie ISD this year, as we welcome students back to the classroom on Wednesday, August 22, 2018! This page will serve as your official "Back-to-School Toolkit,” where you will find registration and enrollment information for new and returning students, school supply information, and important back to school dates. All returning WISD students must enroll online before the first day of school. Parents must be enrolled in Family Access to enroll their child online. Online enrollment for returning WISD students will open on Monday, July 30, 2018. Click here to access Skyward Family Access to register. **IMPORTANT: Please ensure that after completing online registration, you submit necessary documentation to your child’s campus. If this documentation is not received by the campus, your child will not receive their classroom assignment on Bring Your Supplies Night and/or class schedule. You may submit this paperwork during any of your campus’ registration hours (see New Student Registration section). Elementary campuses only: Returning students may turn in required paperwork and register for Family Access during special evening hours on Thursday, August 9, until 7:00 p.m. Global High School: Students DO NOT have to submit proof of residency to receive their schedules. Student and campus forms and documents such as campus handbooks, course catalogs, dress codes, student code of conduct and the school supply list can be found on the "Student Forms and Documents." We are excited to open full-day Pre-K at Turner Prekindergarten Academy this year! All qualifying Pre-K students in the district will attend Turner Prekindergarten Academy, located at 614 Getzendaner. Please call Turner at 972-923-4690 for details on qualification. To download the New Student Enrollment Forms, visit the Student Forms and Documents page. Returning students’ required paperwork may also be turned in during these hours. **Appointment strongly recommended for registration. Please contact your child's campus to schedule an appointment. Walk-ins are welcome, but those with an appointment will be registered first. Upon arrival on registration day, please check in at the front office. **Appointment strongly recommended for registration. Please contact your child's campus to schedule an appointment. Walk-ins are welcome, but those with an appointment will be registered first. Upon arrival on registration day, please check in at the front office. Please contact campuses for new student registration information. ALERT: Elementary students may not walk to and from school until the first full week of school, beginning Monday, August 27, 2018. The WISD campuses need time to properly train all students in all dismissal procedures and safety guidelines. The first week of school is a busy time, and the campuses need to concentrate on the bus and parent pick-up lines only. For a complete list of immunization requirements, including those required for incoming seventh and eighth graders, click here. Students in grades 9-12 will be informed of school supply needs by their instructors on the first day of school. This is the same schedule listed at the top of the page.